AFR® is staying ahead in a competitive field by integrating new event technologies with its catalog of event furnishing rentals. The result is a groundbreaking aid to designers and planners who want to streamline the event planning process. The company’s latest effort is a collaboration that pairs AFR’s® extensive event furnishing inventory with Social Tables’ award-winning, web-based event diagramming solution.AFR® provided Social Tables with 3-D models for more than 250 pieces of its event rental furnishings to create an extensive library. Maximize your event space. Reduce the risk of errors. Create a blueprint that ensures success. Diagrams and event data can be accessed from any tablet for day-of coordination. 24/7 support. Communicate online revisions, requests, and questions instantly to shorten the approval process. Access 2D & 3D renderings of over 250 furnishings from AFR®. Thank you! We use Social Tables, and I just had the time of my life playing with your furniture in our space. I am an avid user of Social Tables and the recent addition of the AFR inventory has been a lifesaver. The ability to play with different styles of furniture while mixing in elements that are out of the norm for a typical grouping has been very helpful. Giving clients the opportunity to see 3-D imaging of the different elements within a room has also been a great tool in closing business. 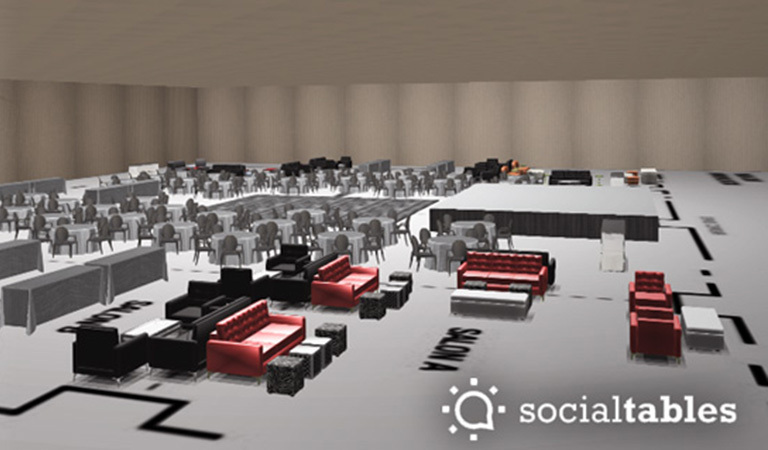 I have used Social Tables for floor plans with AFR® Event Furnishings and found it very helpful. The best part is that AFR’s furnishings were listed in the template so that I could select the furnishings and place them on my floor plan. We were also able to map things out live, so we were on the same page about the layouts. The 3-D renderings were incredible! - Eva Lau, Director of Product Development, Mana, Allison & Associates, Inc.